until the onions start to soften. Bring to the boil then remove from the heat and blend until smooth using a hand blender. Season to taste. Set aside to cool then use as required. Tip: Any surplus sauce can be frozen to use at a later date. Roughly chop the lamb, add it to a large mixing bowl and coat with the yoghurt, half the spices and half the chilli. Cover with Clingfilm and refrigerate. Garnish with fresh coriander and serve with couscous, basmati rice or naan bread and minted tzatziki on the side. Reprinted with permission of Sarah Graham. Cut steak into 5cm squares. Heat ghee or oil in saucepan and gently fry onions, ginger and garlic until just beginning to turn golden. Add curry powder, turmeric, mustard seeds and fry over low heat for 2-3 minutes. Add salt and vinegar and stir well. Add steak and fry, stirring to coat meat well. Add chilies and tomatoes, cover pan and simmer on very low heat for about 2 hours. Serve with rice and other accompaniments. If gravy is too thin when meat is tender, cook over high heat, uncovered, until reduced. Heat oil. Add onion, turmeric, bay leaf, cinnamon, fennel seeds. Fry for a few seconds, until onion softens. Add masala, ginger and garlic, allow to cook for a few seconds but take care not to burn. Add tomato. When almost cooked stir in meat, allow to sauté. Add curry leaves, salt and water to cover. Bring to a boil then lower heat to moderate, and cover. Cook 20-25 mins, then add potatoes. Continue cooking until meat is tender, and potatoes are soft. Spoon into bunnies. Or bowls if you prefer. 3 cardamon pods and a few stick cinnamon. Deep fry cubed potatoes in oil , put aside when done . Soak basmati rice in hot water for ten minutes , get rid of that water , now add fresh hot water about a litre , a teaspoon of salt and some turmeric( optional ) , boil for ten minutes , strain and leave one side . In a big pot fry lamb pieces and onions until golden brown , add the garlic and Ginger and a cup of boiling water cook on medium heat until water has cooked away , stir occasionally . Repeat this process of adding a cup of hot water and cooking the meat about 3 times or until the meat is nearly tender . Now add all your spices and salt , Braise for about 5 minutes , stirring . Now add a cup of hot water and cook on medium heat until meat is tender now add half a cup of hot water the rice , potatoes, butter , the cooked lentils and coriander on top . Cook on medium to low heat for ten minutes , give it only one stir , now switch off the stove, Close the pot , and walk away . Come back in half an hour , dish up and serve with a slaai/ sambal . In a bowl add your chicken , yoghurt, lemon juice , tomato paste , garlic and Ginger , all your spices and salt and whole chillies . Mix everything together with hand . Cover with clingwrap and marinade for a few hours or overnight . In a heated pot on high heat add the oil and onions chopped finely , fry until golden brown , add a cup of warm water and cook the onions until all water has cooked away . Whatever you do , do not add any water to the curry , cook until chicken are tender , 15-20 minutes , before serving add the cream and a bunch of coriander . Please note the cream is quite rich and for that reason I don't add any butter to this dish . You may add butter if you wish to . 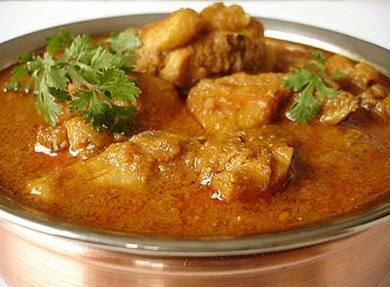 Butter chicken curry describes the almost butter soft textures of the chicken because of the marinating process . Tip - if your curry sauce is a bit on the watery side , simply mix a tablespoon of corn flour with a little water and stir into curry , as we are not using Cashew nut paste in this recipe . If you want to use Cashew nut paste simply soak nuts for an hour in a little water or milk then grind a cups worth till fine and paste like and add to your curry during the cooking stage . NATALIE SE NOTA: Ek dink ek het vandag in die masala pot geval of was net lus vir helder kos, ek weet nie. Al wat ek se is die bediende is weer vort by die deur uit van nies nies vir masala vandag en ek kry mos sulke kykke man dagger stares!! Haar agterstewe sy gaan nog al die goed leer doen sonder my. My skoonma sal so trots wees op my vandag met my hurry curry situasie, In elk geval Tikka hoender met beans curry, cabbage braised in turmeric and mustard seeds en tamatie/dhana slaai met rys natuurlik. Hulle moet hulsef sommer oor mik eet en klaarkry. Is gou eers van die soetgoed af want ek bak nou eers beskuit om die blikke vol te maak. Gaan more karringmelk maak en ek sien iemand het vandag volgraan opgesit by die blog so ek kan weer my Suid Afrika pakkies opmaak met die rooibos en beskuit vir die gaste. Dankie julle vir elke dag se inspirasie. Because I like the sauce to be nice I add tomato to the marinade mix as well. BBQ or Chargrill the chicken separately whilst cooking the left over marinade in separate pot. Pour cooked sauce over chicken and serve. Heat oil and add mustard seeds till it pops and then add all the other ingredients except beans &salt. Cook over medium heat until masala has braised, you might want to add a little water to ensure the masala does not burn, but in an AMC or Tefal pot it should not be required. You can either have this on toast or sometimes I make it for Saturday brunch and add viennas to it and then have it with crusty bread. Of course double or triple your ingredients depending on the amount of people you have. The secret to this dish seemed to be browning the chicken well before adding the almond milk. Grind the ginger and garlic into a fine paste. You should be getting approximately 5 tablespoons of ginger-garlic paste. Marinate the chicken with the ginger garlic paste, chilly powder, vinegar and salt and keep it for an hour. Cook until the chicken is cooked through and browned. Browning the chicken is necessary in order to achieve the desired taste. While the chicken is cooking, take the almonds in a microwave-safe bowl, add enough water to immerse the nuts and cook for 90 secs. Take out and let it cool. You should be able to peel the almond skin off easily now. Take the peeled almonds and grind it into a fine paste by adding water. Add the almond paste and milk to the browned chicken. If you want dinner with a kick, then this Quick Chicken Curry is right up your alley. You can have a dish that's full of flavor on the table in about 30 minutes and your whole gang'll be saying, "OOH, IT'S SO GOOD!!" In a blender or food processor, combine red peppers, onion, broth, coconut milk, and curry powder. Process or puree until completely smooth. Place sauce in a large, deep skillet. Over medium-high heat, bring sauce to a simmer, then stir in chick peas and carrots. Place chicken thighs in sauce, being sure tops are covered. Reduce heat to maintain a simmer and cook, uncovered, 20 minutes, or until no pink remains in the chicken. Serve topped with sauce. When using coconut milk, a common question that comes up is whether or not it's the same as cream of coconut. The answer is that they are NOT the same, cream of coconut is sweetened and much thicker. Cream of coconut is most often used in desserts and mixed drinks. Mix the jeera, coriander and tumeric in a small bowl, coat the chopped chicken breast pieces leave to marinade while you making the sauce. Now make the sauce, fry the roughly chopped onions with the garlic and green chilli in a large saucepan with the tablespoon of oil until browned. While that is simmering, put the chopped tomatoes in a food processor or liquidiser and give it a good whizz until smooth consistency. Heat another large pan and gently fry the ground coriander, cumin and turmeric in a splash of oil for about a minute take care not too overheat or it will burn. Next give your onion mixture a good whizz in the food processor or liquidiser and add it to the spiced tomato sauce. Stir and leave to simmer for another 10 minutes. Keep warm. Add the earlier prepared sauce to the cooked chicken and simmer until combined about 5-10 minutes. Just before you dish it up, stir in the garam masala and chopped dhanya leaves. NOTA: Ek het myne met Cape malay roti bedien en naan brood en ek moet se dit was nogal iets anders en baie lekker veral as mense hou van kerrie maar nie die rissie nie. Die vrou wat die oorspronklike resep geplaas het, het aartappels in gesit want sy se haar gesin hou daarvan maar as voorgereg is dit bietjie erg vir my en my agterstewe. This hearty beef meal is a firm favorite for family and friends. Brown meat in heated cooking oil. Remove from pan. Add onions, mushrooms and curry powder to the same pan and cook until onions are soft. Return meat to pan and add tomatoes, red wine and water. Simmer covered for about 1½ hours until meat is tender Peel then boil potatoes until tender. Drain well and mash. Add the milk, margarine and sachet contents to the mash. Spoon the potato mixture into a greased, ovenproof dish, lining the base and sides and leaving a large hollow in the middle for the meat filling. Fill with meat filling and flatten with a spoon. Bake at 180°C for 25 min or until potato is golden around the edges. ELSIE SE NOTA: Ek het 2 rissies, 'n eetlepel vars gemmer en danja ekstra ingesit. Fry onion and Garlic Flakes for 2 - 3 minutes. Add curry powder and Spice for Mince and fry for a further 2 - 3 minutes. Add mince and fry until it changes colour. Then add all remaining ingredients except the cheese and simmer for 30 minutes. Layer pancakes with curried mince and cheese in alternate layers. Sprinkle cheese on top of stack. Place your stack under the grill till golden brown. Process the rice, milk, eggs, self-raising flour and curry powder in a food processor for 1 minute. Place the potato and onion in a mixing bowl and add enough boiling water to cover. Leave for 3 minutes and drain well. Pat dry with paper towels. Add the potato, onion, chicken, sweet corn and parsley to the batter. Heat the oil in a pan and fry spoonful's of the batter for about 4 minutes on each side until golden brown and done. Heat oil in pot - Then fry onions, add garlic and ginger paste. Add all ingredients except water, tomato and fresh coriander and saute, add tomato last. Saute Lamb in seperate pan and then put into sauce, add water and cook until lamb is tender and sauce is thick. Heat the oil in a saucepan. Add the onion, cardamom pods, cassia and cloves, and sauté until the onion is transparent. Add the remaining ingredients, except the potato and coriander leaves, close with a tightly fitting lid and simmer until the meat is just tender, about 1 hour. Sprinkle with the coriander and serve with jasmine rice or rotis and a selection of sambals. This recipe was created by the legendary Cass Abrahams. Rub Salt and 1/2 tsp Haldi and 2 tsp Oil on the Mutton pieces and let it marinate for about 10 mins while you prepare the gravy. Heat 4 tbsp Oil in the cooker and add 2 tsp sugar. Do not stir. Let the sugar foam and burn to a very dark brown before you stir it. This is what gives any gravy a lovely brown color. Now add Onion and fry till it turns pinkish and translucent.. Add the ginger-garlic paste and fry for a minute. Add the remaining 1/2 tsp Haldi powder, red chili powder, curry powder. Add the marinated mutton pieces and the potatoes to the cooker and fry in the masala for 3 mins stirring occasionally. Add 2 cups water and adjust salt at this point if you feel more needs to be added. Close the cooker's lid and pressure cook for approx 4 to 5 whistles depending on how tender you want the mutton pieces to cook. Garnish with fresh coriander leaves and serve hot with rice or roti! In the same pot brown the onion rings. Add the garlic, sugar and fresh ginger and cook for 1 minute. Fry onions in a pan until just start turning brown. Add the tomatoes, garlic, ginger, curry powder, turmeric, cumin/coriander powder, gharum masala and salt. Mix well and cook until all the ingredients are blended – this can take +- 5 minutes. Add the lamb chops to the pan and mix into the curry sauce. Cook for about 8 minutes stirring occasionally. Add the peas. Add sufficient hot water to cover the chops. Lower the heat and simmer for 30 minutes adding more water if necessary. Add the potatoes and cook for about 20 minutes or until the potatoes are fully cooked. In a large saucepan, melt the butter over moderate heat. Add the onion and cook until starting to soften, about 3 minutes. Stir in the cardamom, turmeric, cloves, cinnamon, rice, and the remaining 1 1/4 teaspoons salt. Cook, stirring, for 1 minute. Add the lamb mixture to the pan. Stir in the water and raisins. Bring to a simmer. Cover and simmer until the rice and lamb are almost done, about 20 minutes. VARIATION: Other nuts, such as almonds or pistachios, can easily stand in for the cashews. In a deep bowl, mix together the ginger, garlic, green chilies, garam masala, red chili powder, turmeric, teaspoon of salt, cilantro and mint. Add the lamb and mix to coat. Marinate at least two hours in refrigerator or, ideally, overnight. After marinating, add the yogurt to the lamb and mix well. Turn the slow cooker on low. Add the onions, 2 tablespoons of the oil and the marinated lamb to the slow cooker. Cook for 2 hours. On the stovetop, bring the water to a boil over medium-high heat. Add the rice and tablespoon of salt and turn the heat to low. Allow the rice to simmer for 3 to 5 minutes, at which point most of the water will have evaporated. If it has not, use a slotted spoon to transfer the rice to the slow cooker. Discard any water remaining in the pot. Level the rice in the slow cooker with the back of a spoon. Drizzle the rice with the remaining oil and the saffron/milk mixture, if desired. Cook for 1 hour, fluffing the rice once or twice. Scoop and serve this amazing one-pot meal. Your taste buds will transport you to the bustling,vibrant Indian city of Kerala. 1. Liquidise the coconut milk, chopped tomato, tomato paste, salt and Spice Mecca Seafood Curry Masala. 2. Braise onions in oil until golden brown. 3. Add garlic paste and fry for 2-3 minutes. 5. Add fish or seafood and cook for a further 10-15 minutes. 6. Garnish with freshly chopped green coriander.